6 AM Weather very dull and rain at intervals. 8 AM Situation Normal – Wind North. 2 PM Our artillery very active all day on enemy wire – strong points and trenches and our heavy Trench Mortars doing good work on wire in front of enemy position. 5 PM Hostile artillery activity on our Support Lines – No casualties. Wind still North. 8 PM “A” and “C” Companies left VILLERS AU BOIS for front line – Weather very stormy and continual heavy rain. 10 PM Battalion Operation Order by Lieut-Col. G. C. Johnston. M.C. Commanding, issued. (1) The Canadian Corps, will at time and date to be notified later, in conjunction with a larger operation by the THIRD ARMY on the RIGHT, attack and capture VIMY RIDGE. 8th Can. Inf. Brigade on the RIGHT. 7th Can. Inf. Brigade on the LEFT. 9th Can. Inf. Brigade in RESERVE. The 5th Canadian Infantry Brigade will attack on RIGHT of 8th Canadian Infantry Brigade. the 2nd K.O.S.B., will be on the RIGHT of the 1st C.M.R. in the attack on BLUE OBJECTIVE.
) Will move from MAISNIL-les-RUITZ to FORRESTER CAMP (Villers au Bois) on 20th. March, 1917.
) Will remain at MAISNIL-les-RUITZ. till 22nd. March, 1917. All ranks remaining in MAISNIL-les-RUITZ, will be under Command of Major S.B. Van Kleeck. 9 AM Advance parties proceeded from ESTREE CAUCHIE to take over new billets at MAISNIL – LES – RUITZ at 9.00 A.M.
11.30 The Battalion left ESTREE CAUCHIE at 11.30 A.M., to take over new billets at MAISNIL – LES – RUITZ. 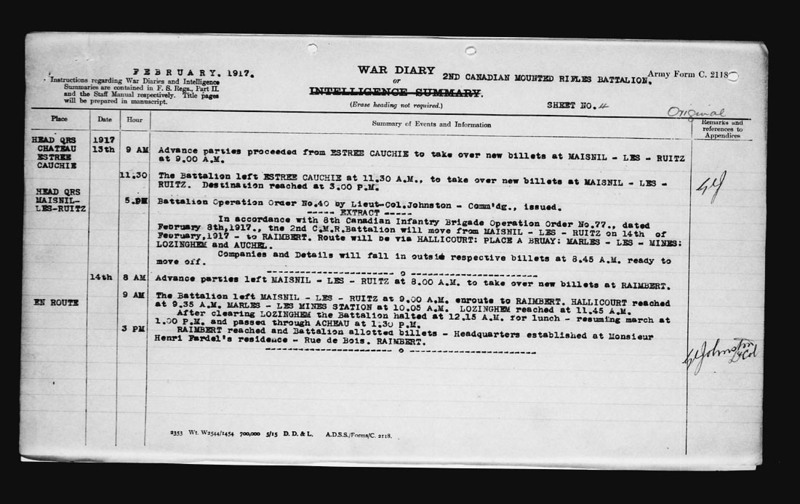 Destination reached at 3.00 P.M.
5.PM Battalion Operation Order No.40 – by Lieut-Col. Johnston – Comm’dg., issued. 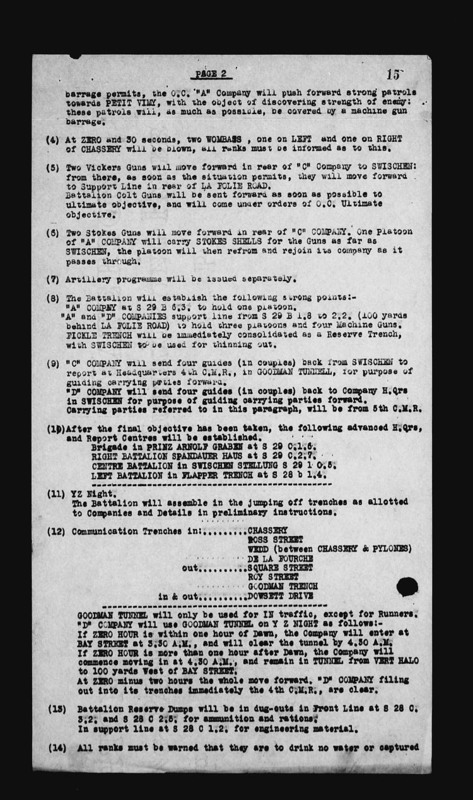 In accordance with 8th Canadian Infantry brigade Operation Order No. 77., dated February 8th, 1917. , the 2nd C.M.R.Battalion will move from MAISNIL – LES – RUITZ on 14th February, 1917 – to RAIMBERT. Route will be via HALLICOURT: PLACE A BRUAY: MARLES – LES – MINES: LOZINGHEM and AUCHEL. Companies and Details will fall in outside respective billets, at 8.45 A.M. ready to move off. 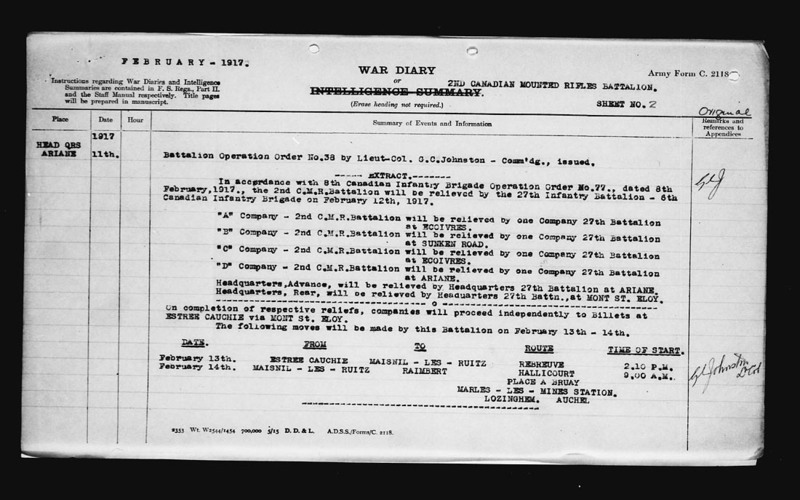 Battalion Operation Order No.38 by Lieut-Col. G.C.Johnston – Comm’dg., issued. In accordance with 8th Canadian Infantry Brigade Operation Order No.77., dated 8th February, 1917., the 2nd C.M.R.Battalion will be relieved by the 27th Infantry Battalion – 6th Canadian Infantry Brigade on February 12th, 1917. Headquarters, Advance, will be relieved by Headquarters 27th Battalion at ARIANE. Headquarters, Rear, will be relieved by Headquarters 27th Battn., at MONT ST. ELOY. 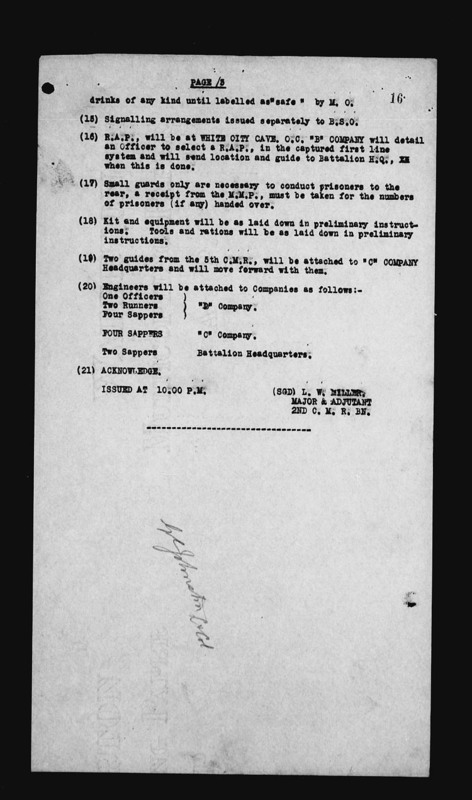 On completion of respective reliefs, companies will proceed independently to Billets at ESTREE CAUCHIE via MONT St. ELOY.The following moves will be made by this Battalion on February 13th – 14th. MARLES – LES – MINES STATION. 6 AM Weather fine – some snow during night. 9 AM In accordance with Battalion Operation Order No.37., “B” and “D” Companies – 2nd C.M.R.Battalion left BOIS des Alleaux for the trenches – ARIANE – relieving the 1st C.M.R. Battalion., route via MONT ST. ELOY and MAROEUIL. 4 PM Relief complete – no casualties.Forward Headquarters established at ARIANE – A. 20.D.4.5. North West of ECURIE. From February 2nd, 1917 to February 11th, 1917 – “B” COMPANY (SUNKEN ROAD) – “D” COMPANY (ARIANE) furnished working parties burying cable. During this tour the Battalion had only one casualty – one man wounded. OFFICERS ON DUTY DURING TOUR. Lieut-Col. G. C. JOHNSTON – Comm’dg. Sun., Jan 21, 1917 A.28b.7.8. 6 AM Weather fine – cold. 10 AM Wind North East – Situation quiet. 3 PM Enemy trench mortars and artillery quiet. 5 PM At enemy signals, heavy trench mortar bombardment started all along Battalion frontage until about 5.15 P.M. Very little damage done to trenches – our casualties 7 wounded. Our artillery open fire on enemy positions with heavy calibre guns very effectively. 8 PM Situation Normal – Wind still North East. Battalion Operation Order by Major G.C. 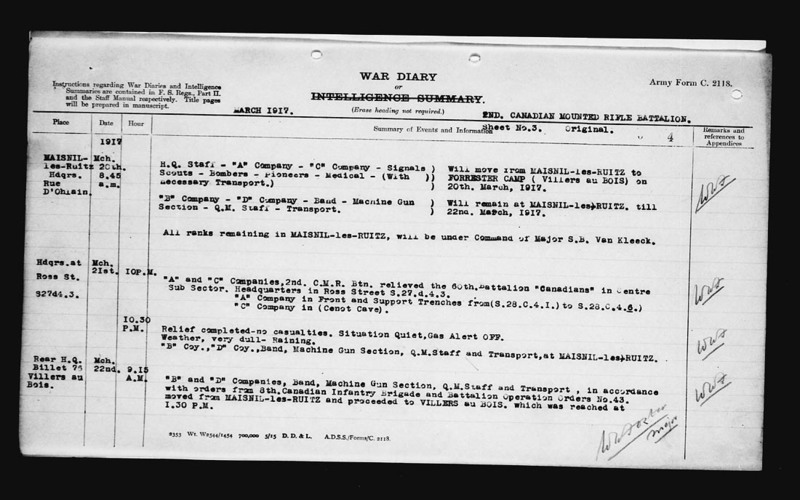 JOHNSTON – Commanding 2nd C.M.R. Battalion issued. 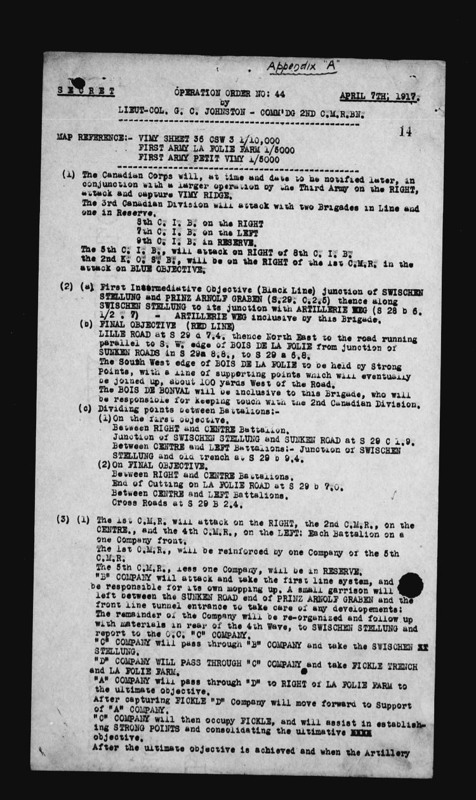 EXTRACT FROM BATTALION OPERATION ORDER NO. 36. In accordance with 8th Canadian Infantry Brigade Operation Order No.74 – the 1st C.M.R. Battalion will relieve the 2nd C.M.R. Battalion in R 2 sub-sector on January 23rd ,1917. On completion of above relief, Companies and Sections of 2nd C.M.R. 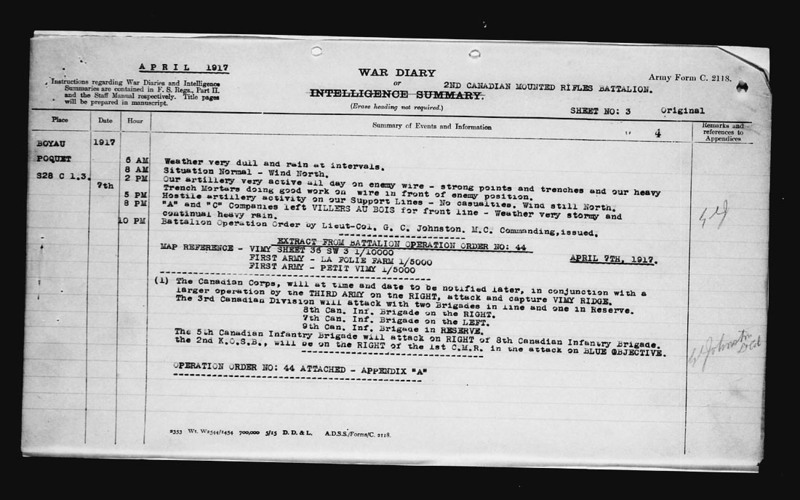 Battalion will proceed to Billets at MONT ST. ELOY – route will be via ANNIVERSAIR TRENCH and MAROEUIL. Companies will assemble at MAROEUIL. Mon., Jan 15, 1917 A.28b.7.8. 6 AM Weather cold – freezing. 6 PM Battalion Operation Order No. 34 by Major G. C. Johnston – Commanding 2nd C.M.R. Battalion issued. 6 PM Working party of 60 men engaged on general trench repairs. “A” Company – 2nd C.M.R. relieves “C” Company – 5th C.M.R. LEFT FRONT. “C” Company – 2nd C.M.R. relieves “D” Company – 5th C.M.R. RIGHT FRONT. “D” Company – 2nd C.M.R. relieves “A” Company – 5th C.M.R. SUPPORT. H. Qrs Section “ “ H. Qrs Section “ LILLE POST.